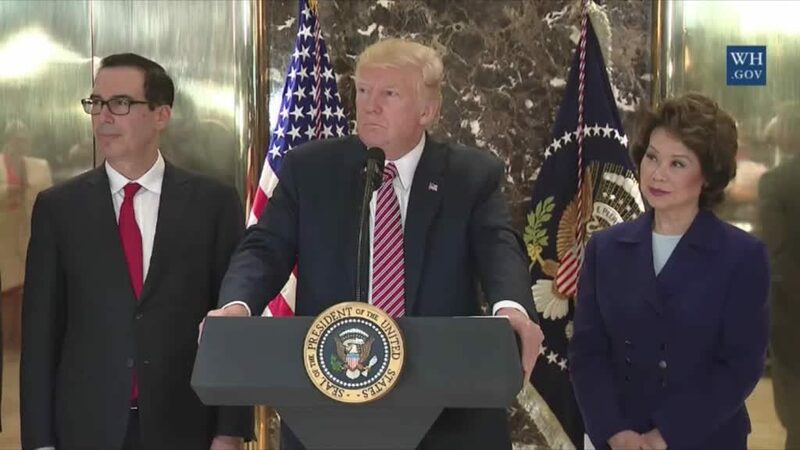 Earlier this week, President Trump held a press conference in the lobby of Trump Tower, where the president — flanked by Transportation Secretary Elaine Chao and Chief Economic Advisor Gary Cohn — delivered an impromptu series of remarks on the weekend’s white supremacist violence in Charlottesville. It was the President’s third commentary on the neo-Nazi rally in Virginia that left one woman — Heather Heyer, 32, — dead and eighteen others injured after a white supremacist drove his car into a crowd of non-violent counter-protesters. In his initial remarks delivered soon after Heyer’s killing, Trump refused to condemn neo-Nazi demonstrators and instead blamed the violence “on many sides”; he received widespread and bipartisan criticism for the equivocation. The White House was quick to attempt damage control, issuing a tepid statement that attributed condemnation of white supremacists to an unnamed White House representative. On Monday — more than 48 hours after Charlottesville was besieged by white supremacists — Trump also delivered a prepared statement that labeled white supremacists and neo-Nazis as “repugnant”. Again, Trump was widely criticized for offering too little, too late. Within hours of issuing those second comments, Trump returned to Twitter to rail against his critics for being dissatisfied with the remarks. By Tuesday, Trump was once again ready to give up the charade that he was not on the side of neo-Nazis. In Tuesday’s press conference — ostensibly held to unveil the administration’s latest infrastructure reforms — Trump doubled down on his moral equivalence between violent white supremacists and the counter-protesters who demonstrated against their racism. Manufacturing a supposed “alt-left” (experts agree that the term was invented by conservative media as a slur against leftists), Trump alleged that left-wing activists attacked white supremacists with clubs and provoked the weekend’s violence. Trump concluded his bizarre commentary by undermining his previous day’s remarks and blaming “both sides” for Charlottesville, albeit with more of his moral outrage directed towards leftist counter-protesters. 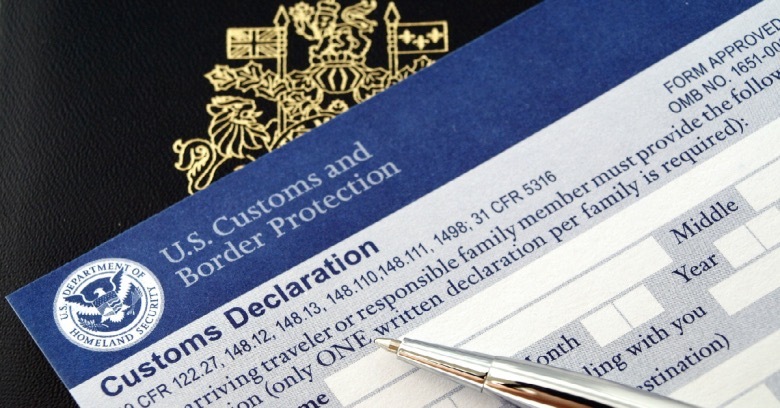 A customs declaration form from US Customs and Border Protection. Last month, US Customs and Border Protection announced a proposal to institute a “voluntary” social media check of Chinese travelers to the United States. The proposal would add an “optional” question requesting account information for an applicant’s social media accounts to the Electronic Visa Updates System (EVUS), the system that foreign visitors use to manage their visa applications to the United States. A mandatory social media check policy is already proposed or in place for travelers from several Muslim-predominant countries, and those practices have already been widely criticized as unreasonable and unjust. It is unclear how voluntary the proposed “voluntary” social media check of Chinese travelers will be in practice. Right now, Congress is considering the Marketplace Fairness Act, a bill that would change US tax law to allow states to collect taxes from online retailers, even if those retailers are physically located outside of the state of the sale. The Act is backed by the Alliance for Main Street Fairness, a public relations groups which argues that existing tax loopholes disadvantage the mom-and-pop brick-and-mortar small businesses of American “Main Street” by requiring them to pass the cost of state taxes onto their patrons, while online retailers can charge lower prices for the same goods. Ironically, however, the Alliance for Main Street Fairness doesn’t actually just represent small business; instead, it includes among its members big box-store retailers such as Target, Walmart, Best Buy, Home Depot and JC Penney. This month the Alliance for Main Street Fairness has set its sights on lobbying for the Marketplace Fairness Act using ads that specifically target Alibaba, a Chinese eBay-style online retailer. These ads draw upon Yellow Peril fears by casting a Chinese face as the destroyer of Main Street. In addition to the ad embedded above, the group has released a cartoon showing a red wrecking ball emblazoned with the name “Alibaba” and the yellow stars of the Chinese flag smashing the windows of an American Main Street shop (after the jump).